The following architecture overview shows available framework components. 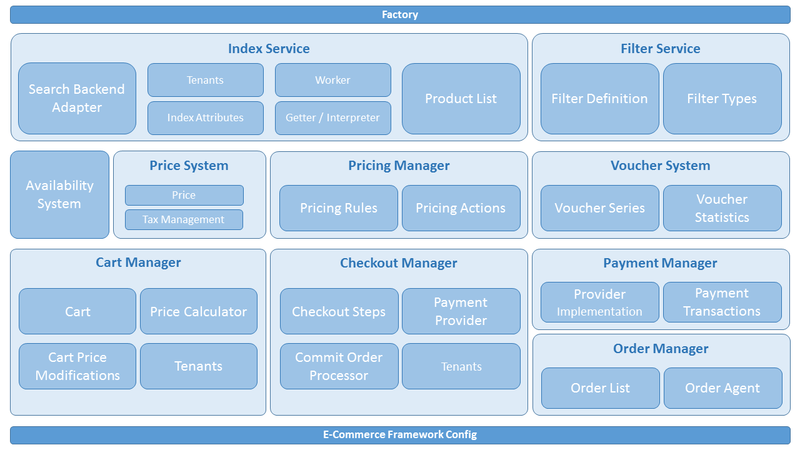 The component configuration takes place in the pimcore_ecommerce_framework configuration node and a factory is responsible for resolving of the implementations. For each component a custom implementation can be configured and used. The Index Service is responsible for all aspects concerning indexing products and providing an API to access product data from the index. Defining which attributes should be indexed. Implementations for different search backends (e.g. mysql, elasticsearch, fact finder, findologic). Product Lists as the API to access the product data stored in the search index. Product Lists can be used by controllers to display product listings. The Filter Service is responsible for all aspects concerning filtering products and setting up a filtered navigation. It is tightly coupled with the Product Lists of the Index Service, provides the developer a simple API for building a layered navigation and takes care of query generation, counting results and stuff. The Availability System is responsible for all aspects concerning product availability. Here the logic for calculating availabilities, calling external availability services, etc. is encapsulated. Each product has an Availability System assigned and when it comes to getting the availability of a product, this should be delegated to the Availability System of the product. Like Availability Systems, there are Price Systems which are responsible for all aspects of getting product prices. Here the logic of calculating the product prices should be encapsulated. Each product has a Price System and when it comes to getting the price of a product, this should be delegated to the Price System of the product. Also Tax Management is located in this component. In addition to the Price System, there is the Pricing Manager which is responsible for all aspects concerning modification of prices for marketing purposes. Therefore pricing rules (e.g. certain products, certain time frames, ...) build conditions which need to be valid that certain pricing actions (e.g. product price discount, free shipping, ...) are executed. Modification of product prices based on vouchers which is done with the help of the Pricing Manager. The Checkout Manager is responsible for all aspects concerning checkout process and an one-stop API for getting through the checkout process. The Checkout Manager always works with a cart and at certain points in the checkout process it delegates to other components to convert the cart to an order object (Order Manager), start payment operations (Commit Order Processor and Payment Manager) and commits the order (Commit Order Processor). The Commit Order Processor is part of the Checkout Manager namespace and is responsible for all aspects concerning committing and order. In contrast to the Checkout Manager, the Commit Order Processor does not work with carts anymore and can be initialized without a cart. Therefore it also can be used to commit orders in combination with server side payment notifications when no cart is available anymore. The Payment Manager is responsible for all aspects concerning payment. The main aspect is the implementation of different Payment Providers to integrate them into the framework.